Cows in Pasture, Arthur Dove, 1935. This is the second post on the work of Ronald Johnson's poetry. It continues with a consideration of our favorite poem of Johnson's, Three Paintings By Arthur Dove, which was published in his first book, A Line of Poetry, A Row of Trees. I might mention in passing that the title of that book, which was published by Jonathan Williams and his Jargon Press, suggests preoccupations that would become increasingly important to Johnson during his writing career. The sense of writing as having a graphic resemblance or link to abstract form, is central to the concept of Concrete Poetry. Not everyone knows this, but Johnson kept up a steady interest in concrete poetry, or word-in-image composition, throughout his "straight" writing life, and published several livres d'artist booklets in this genre or mode. 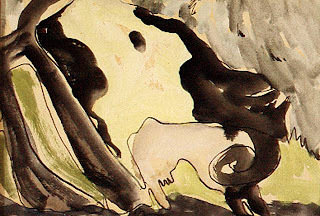 The second section of the poem under discussion, Three Paintings by Arthur Dove, is Cows in Pasture (pictured above). 'Raw sienna, black & green'. And there are no cows. careful not to step on snails. Do I hear the encyclopedist's clerical air in these lines, especially in the quotations, which sends me back to Marianne Moore? I do. The interest in specificity, the taxonomic delight in inspired definition, which is the scientist's mettle, confirmation of origin(s), birth of naming, assumption of external authority. Could any tendency be less poetic? And yet what we hear--and feel--is delight! Here is pastoral engaging directly with textures, essences, through the vivid and tactile sounds and frictions among syllables and consonants--we're walking, there is grass, mud, bark, twigs, even snails! Ever stepped on a snail? Our feet are bare, the "bare heel" of the first stanza. You'd have to have a tough heel to crack a chestnut, especially if it was still encased in its gnarly green casing. Doubtless cows, in their meanderings, lowing as they go, step on countless such burrs, or nuts (or snails!). Nature could be said to count on such events, for the proliferation of her kinds, the natural hybridization of species. Aesthetically, "form has no size" and resemblances between mountains and heads are purely gratuitous. But resemblances are the stuff of art, whether through anthropomorphism or metaphoric vision. Behind this impulse to deduce meaning from structure lies the figure of Blake, the symbolic Visionary deluxe. You can almost feel the language--syllables--straining to become what they are describing, as if words could be the things they were signs of. The quality of immanence, or " the divine as existing and acting within the mind or the world" as a means to transcendence, is characteristic of Johnson's verse. Over and over, in various ways, you feel the urge to pass through the forms of matter into a higher reality of being or awareness. At no point do we abandon the physical fact of our bodies, or of our apprehension things, but we acquire a higher awareness of their nature, their qualities, their function, and beauty, through the process of imagining them through words, in words (inwards). Coming in Part III, an examination of Arthur Dove, and the third part of Johnson's poem. but without the terror & horror that such vegetating immanence so often provokes in Blake. There's such gentleness & delicacy in RJ. "careful not to step on snails"
not Blake's "terrific numbers," but "the mild & gentle for the mild and gentle parts" to their furthest extension: "'these moving circles in which we walk'." The more I think about it, the more I believe Johnson's model was indeed Blake. Not the roaring rhetorician of the visionary poems, but the Blake of the lyrics and paintings. Also, Samuel Palmer, the visionary British painter. His landscapes feel like science fiction. More about them both later. Sure, and, of course, the writing through Milton in RADIOS is a consummately Blakean project. Which may lead back to the paired crunches of the bare heel tough enough to open chestnut-burrs, still "careful not to step on snails." A dialectic of force & restraint? Though no surprise if a poem takes notice where it puts its feet.